With Vienna 3 Fold Screen with Doors manufactured by Napa Forge, you can make your fireplace look more attractive owing to its stylish hand-forged scrolls across the frame and its doors. Its looks are very appealing and charming because of the decorative leaf and vine detail on doors and frame and its flat panel screen. Its unique feature includes beautiful scroll and arched top design. The well-built doors allows for easy access to fire. Thus, assures your safety and security of your home. All Napa Forge fireplace accessories are made up of best quality materials. Screen sizes listed are for actual framed mesh area and do not include feet or decorative finials. 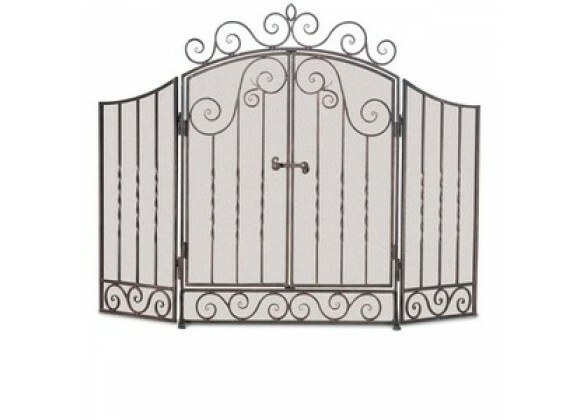 Its unique feature includes beautiful scroll and arched top design. Available in two finishes, Brushed Pewter or Brushed Bronze. Hand forged scrolls dance across the frame and doors on this folding screen. Decorative leaf and vine detail on doors and frame.